Winter is the high season for mussels, which in Korean means chiefly red clams. 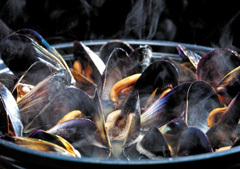 Mussels can be poisonous after May, when they spawn, hence the adage that they should only be eaten in months ending in "r."
In a Chosun-era encyclopedia, mussels are described as unique because they are the only seafood that is not salty, which indicates the special esteem in which they were held. Thanks to their mineral content they are said to help prevent anemia and improve skin health. A clear soup of mussels is rich in taurine and effective for recovering stamina -- a delicate way of saying it is traditionally eaten as an aphrodisiac. Unlike some foods whose flavor and nutrients are destroyed by drying, dried mussels are good to eat and often used in Oriental medicine.